It was the originality of the songs played by Mrigya that won the hearts of the audience. Indeed, it was simply a treat for the people to hear them perform. 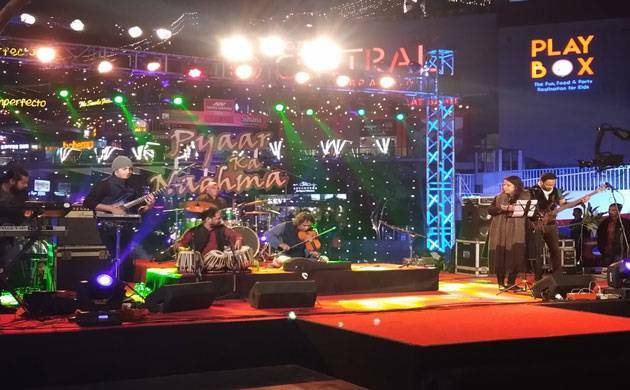 Popular fusion music band Mrigya mesmerised the audience in a concert oragnised by News Nation. The event was nothing short of a blockbuster as Mriya set the stage on fire with their electric performances. The popular band who is known for their unique style ensured that the people had a gala time. Renowned lyricist and poet Santosh Anand was the chief guest at the musical concert which saw the collaboration of old and new music. Anand stole the limelight and was the star of the evening. The audience gave the veteran lyricist a standing ovation when he sang his evergreen song ‘Ek Pyaar Ka Nagma Hai’. Mrigya also performed on the same number and set the mood for a musical evening. The audience was completely floored by Anand’s charm who revealed the inspiration behind ‘Ek Pyar Ka Nagma’. The veteran lyricist also revealed his journey in Bollywood and how Manoj Kumar introduced him in the industry. Music expresses even those things which one cannot say and the music feast was the perfect way to end 2017 and give a warm welcome to 2018.